During April, you get 10% off all Gates belts and hoses! 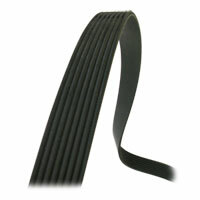 The Gates Micro-V K081264 serpentine belt for your '03-'12 Dodge Cummins Turbo Diesel truck is designed to be the quietest and highest performing belts in the industry. For trucks with air-conditioning. Special belt constructions eliminate belt noise, reduce tension loss and solve problem drive applications. Last 50%-60% longer than value line belts. Precision ground to assure optimum belt-to-pulley fit. Special formation process for precise dimensional control. Reinforced with stretch-resistant, thermally active polyester tensile members. Meets or exceeds SAE J1459 specifications. You should check the serpentine belt at every oil change for cracks and chunks missing out of it and general wear. If you see these, it is time to replace the belt. 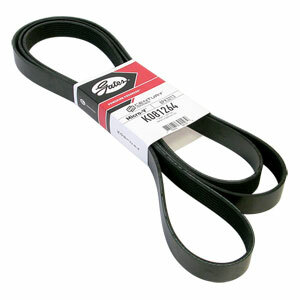 A Gates belt wear gauge is included with the purchase of this belt. While the belt is off for replacement, give the belt tensioner pulley a spin and listen for bearing noises. 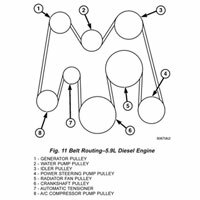 A squealing belt can be a sign that the belt tensioner is failing and causing belt misalignment. The best way to prevent belt failure is to Be System Smart and think I60 & R90. Inspect the serpentine system at 60K miles and replace worn components by 90K miles or as advised by the manufacturer.